On a quiet Saturday morning in November, I gathered with six amazing ladies in a modern barn on Sauvie Island to celebrate good food, friendship, and the coming holiday season together with Bob's Red Mill and Tillamook. Brunch is one of my favorite meals - that perfect combination of sweet and savory items that are satisfying and delicious. Combined with a fire roaring in the stove, light streaming in through windows framed by fragrant garlands, and a table brimming with thoughtfully-made dishes from photographers, stylists, and bloggers who all adore food, and it made for one magical morning. The Portland Holiday Brunch offered a platform to showcase some of our favorite products from these two local companies whose commitment to quality made for the perfect partnership. Nothing says brunch to me more than a piled-high stack of pancakes, which I made with ivory wheat flour, old-fashioned oats, and farmstyle Greek yogurt. I recently finished reading Michael Pollan's Cooked: A Natural History of Transformation and was struck by his meticulous description of the process of creating white flour, which strips away all the nutrition. I've experimented with a variety of flours over the years and was excited to try the oatcakes with ivory wheat flour. 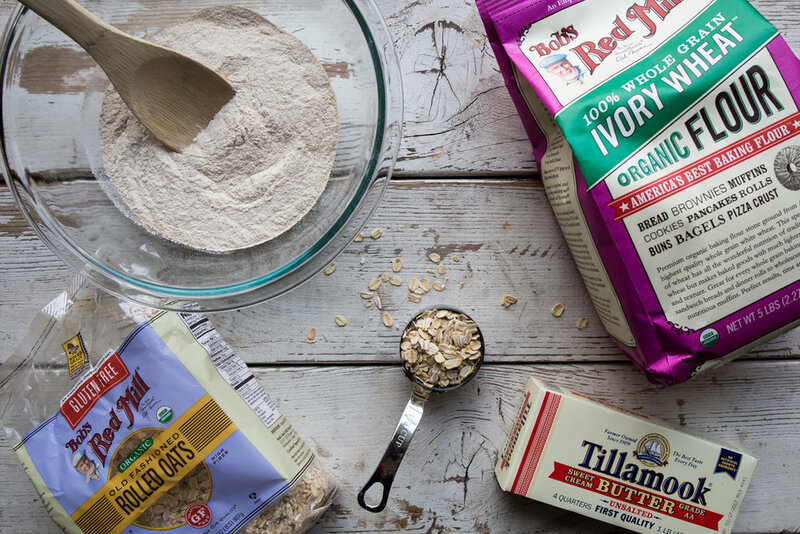 The stone ground flour is made from organic whole grain hard white wheat berries, which is a new variety of identity-preserved wheat containing the bran, germ and endosperm. All the wholesome goodness of wheat flour, but lighter and ideal for healthy baking. Mixing farmstyle Greek yogurt into the batter added a fluffiness that complemented the mild density of the flour, and oats gave extra structure to the pancakes. I then topped the oatcakes with vanilla Greek yogurt and a cranberry-blueberry compote. All the ladies who joined are sharing their recipes created for the brunch and my recipe for the Yogurt Oatcakes with Cranberry-Blueberry Compote is below! In a large bowl, mix together the flour, oats, baking soda, baking powder, sugar, and salt. In a medium bowl, combine the plain Greek yogurt, milk, butter, and eggs. Whisk until just blended. Slowly add the wet ingredients to the dry ingredients and mix until a thick batter forms. Warm a large cast-iron pan over medium heat and melt butter to coat the pan. Spoon about ⅔ cup of batter onto the pan. Cook until small bubbles begin to form on the surface of the pancake. Flip and continue to cook until golden brown. Transfer to a platter and keep warm in the oven. Bring the apple cider and agave syrup to a simmer in a medium pot. Add the cranberries and blueberries, stirring occasionally until the cranberries begin to pop. Simmer until the berries have softened. Remove from heat, stir in the nutmeg and let cool slightly. Blend if desired. Serve oatcakes warm with a heaping spoon of vanilla Greek yogurt and cranberry-blueberry compote on top. Enjoy!